San Jose is the technological capital of California. It is located to the south, in the Bay Area of San Francisco. San Jose is located in the center of Silicon Valley, housing large fashion stores, restaurants and entertainment for its visitors. Much of the center is residential, but the modern bars and nightclubs provide a cheerful nightlife. Silicon Valley presents a Mediterranean climate, with sunny days and an average temperature of 73ºF (23°C). 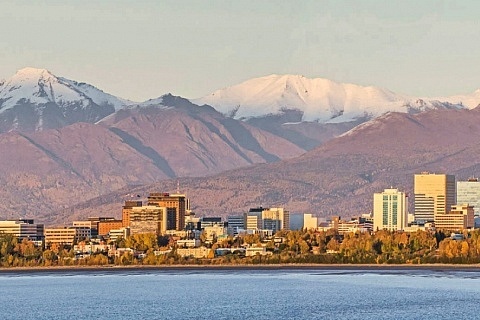 It is recommended to visit Silicon Valley from mid-June until the end of September for its open skies and warm weather, but taking into account that, on the south side, the rains are frequent. Silicon Valley is known as the mecca of technology, and home to the geeks of California for its many companies and major sites dedicated to computing and technology, such as Google, Apple, HP or Facebook. Those wishing to stay in Silicon Valley can reach the San José airport to the north, about 30 minutes from the city center. In Silicon Valley, the public transport system includes light rail, buses and taxis. 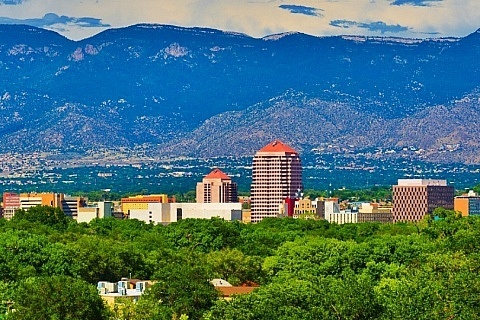 As for the best areas to stay in San José, Downtown offers the best combination of shopping, attractions and nightlife. See accommodation in Downtown San Jose. 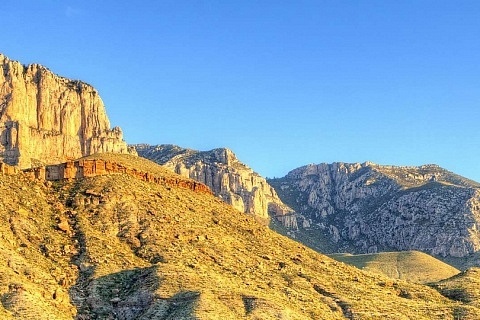 Here’s a guide with the best areas to stay in San Jose & Silicon Valley, Nevada. Downtown San Jose is recommended as one of the best areas to stay in the Silicon Valley for its offer in performing arts, as well as for being the historic center of the city. 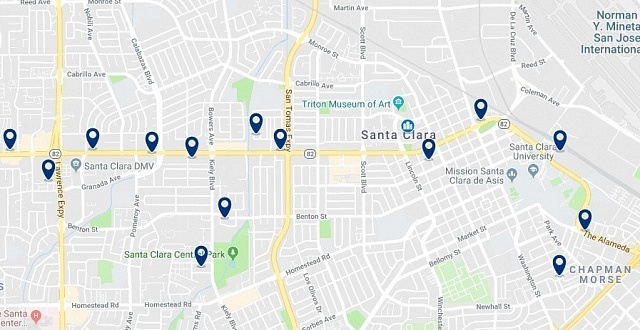 The Downtown also has excellent transport links, thanks to the central train station and its 9 lines that run through the city on Cahill Street, and the bus stops on Santa Clara Street. Among the attractions of Downtown San Jose are the Museum of Innovation, the Center for the Performing Arts, the Museum of Art, as well as shopping centers and department stores. The east side of Downtown in San Jose has many restaurants and bars, where you can take a break from the busy center, and enjoy the best cuisine in the city. Downtown San Jose is recommended among the best areas to stay in Silicon Valley for its easy access to other districts, and variety of options when it comes to entertainment. Located at the foot of the San José Mountains, this hotel features a large outdoor pool and a 24-hour fitness center. The rooms include free WiFi. Located 4 minutes’ drive from Mineta San José International Airport, this motel offers a 24-hour front desk with multilingual staff. It offers rooms with cable TV. Located in downtown San Jose, this hotel features a luxury spa, 4 restaurants and an outdoor rooftop pool. The SAP Center at San Jose and San Jose State University are a 10-minute walk away. Palo Alto is another Silicon Valley area located in San Francisco Bay, 20 minutes from San Jose, and known for being a green neighborhood because of the rivers and oaks that it houses. It is possible to travel through this district using public transport since Palo Alto does not have parking space for those traveling by car. However, you can use the municipal parking spots for two or three hours. Palo Alto has its own airport, although the main one for those visiting Silicon Valley is the San Jose International Airport. 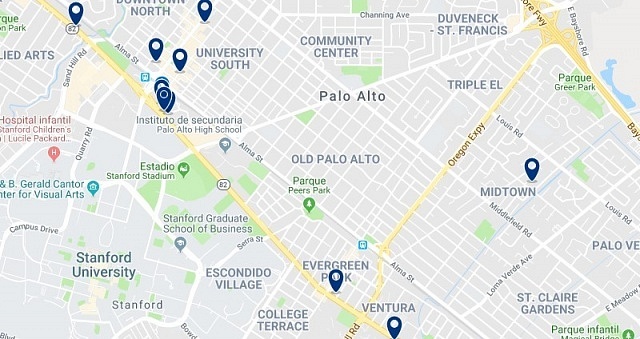 This area is covered by buses and trains, with stations in the center of Palo Alto, California Avenue and Alma Street, although many travelers and locals prefer to use a bike because of the residential and university environment of the area. The leisure in Palo Alto is on University Avenue with its shops, the Stanford Shopping Center and its fashion boutiques, or the Stanford Theater. Palo Alto is among the best areas to stay in Silicon Valley for its offer in entertainment or for business travelers. The Comfort Inn Palo Alto is conveniently located 3 miles from Stanford University, and minutes from popular attractions such as California’s Great America and the San Jose Convention Center. This small hotel in Palo Alto is 3 miles from Stanford University. It offers air-conditioned rooms with free Wi-Fi. All rooms at the Glass Slipper have cable TV and a bathroom. Located in Palo Alto, Silicon Valley, adjacent to Stanford University, this hotel offers dining options and a modern fitness center. All rooms have a flat-screen cable TV. Santa Clara is another neighborhood that makes up the Silicon Valley area. Santa Clara is located northwest of San Jose and is considered a business area because of the companies it houses, which are related to the field of technology. This area is next to the San Jose airport, so it is recommended for travelers who want to make a quick visit, or for business travelers. Those staying in Santa Clara can visit the California’s Great America Amusement Park, the Intel Technology Museum and several casinos to enjoy the lively nightlife that reigns in the area. Thanks to the University of Santa Clara, this area hosts a vibrant young community, which restaurants and bars filled with young adults. To travel to other Silicon Valley districts or through Santa Clara, train and bus stops are available on W Tasman Drive. Santa Clara is one of the best areas to stay in Silicon Valley for business travelers or those attracted by companies that provide services in the areas of technology. Less than 1 mile from Santa Clara University, this hotel offers free Wi-Fi, free daily continental breakfast and rooms with flat-screen cable TV. This Silicon Valley property offers comfortable rooms and studio suites with free Wi-Fi. A free breakfast is served daily, and there is a restaurant on site. Levi’s Stadium is 7 minutes away by car. South San Francisco is divided into several important neighborhoods such as Sunshine Gardens, Avalon Park, Winston Manor, and Buri Buri Ranch. South San Francisco is known as a business area, thanks to its industrial environment and offices with futuristic architecture. Due to being close to San Francisco International Airport, South San Francisco provides accommodation in luxury hotels, as well as good connections to other parts of the district through public transport and taxis. The area is known as the “industrial city” and pays tribute to its past with a large historic sign on the hillside, which faces the bay and offers amazing views. South San Francisco (or “South City”) is one of the recommended areas where to stay in the Silicon Valley for its wide range of hotels and proximity to the largest technology companies. This modern hotel is conveniently located and offers a shuttle service to San Francisco International Airport, 4 miles away. All rooms include free WiFi. This South San Francisco motel is close to several places of interest such as San Francisco State University or the BART public transportation station. It offers practical facilities and comfortable rooms. The AC Hotel by Marriott San Francisco Airport / Oyster Point Waterfront is located in South San Francisco, California, 2 miles from South San Francisco Conference Center. This 3-star hotel has a garden.